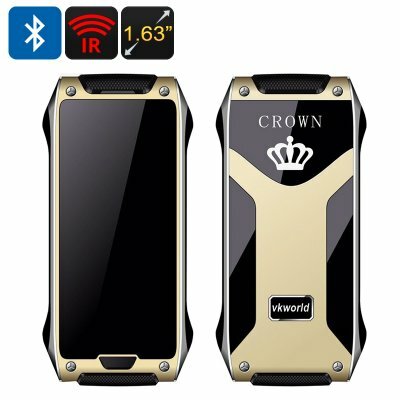 Successfully Added VKWorld CROWN V8 Cell Phone - 1.63 Inch Gorilla Glass Screen, Dual SIM, IR Blaster, Thermal Touch, Bluetooth (Gold) to your Shopping Cart. Sporting thermal touch, Bluetooth, dual SIM and an IR blaster, the The VKWorld CROWN V8 is not as simple as it seems. Featuring an array of interesting features, it’s really convenient in use and would make for a great secondary phone. With dual SIM support, you will be able to manage two accounts on the same device. The 1.63 inch OLED screen is well protected with Corning Gorilla Glass 4 and the phone’s string build makes it resistant to damage. The screen’s anti blue light technology also keeps your eye protectedby softening the effects lengthy periods spent glues to the phone screen. A truly innovative feature of the The VKWorld CROWN V8 is its thermal touch screen that opens up new ways to interact with the device. The V8 also features a built-in IR blaster for quick control of your TV, aircon or other compatible appliances. The VKWorld CROWN V8 keeps you on your toes — literally. Coming with a built-in pedometer, it will let you stay on track with your daily activity and move closer to towards your fitness goals. The cell phone’s SC6531Dprocessoruses a low power consumption chipset and makes the phone’s 780mAh last longer. Enjoy continuous usage time of up to 3 hours and 24 hours on standby. The VKWorld CROWN V8 works great as a secondary phone. Its Bluetooth functionality makes the phone easily compatible with other devices — like an iPhone or Android phone. You will be able to sync contacts, play music, talk, send messages and more. The VKWorld CROWN V8 cell phone comes with a 12 months warranty, brought to you by the leader in electronic devices as well as wholesale cell phones..